No. 3: Break free of mom guilt. Alli Webb is one of our 2018 TODAY Style Heroes. Click here to see the full list! She's the founder of Drybar, a chain of salons where women can get their hair blow dried and styled ("No cuts. No color. Just blowouts." as the tagline reads). Webb has learned a lot since she launched the company in 2010 with her husband, Cameron Webb, and her brother, Michael Landau, and she’s happy to share the wisdom she's picked up along the way. In fact, her new podcast,“Raising the Bar with Alli and Michael,” is all about encouraging budding entrepreneurs. Here, Webb shares five key tips for entrepreneurs, especially women, who are starting businesses of their own. I think that starting out, most entrepreneurs don’t realize how much is at stake and how much of yourself you give up in terms of your freedom and your time and your mental capacity. 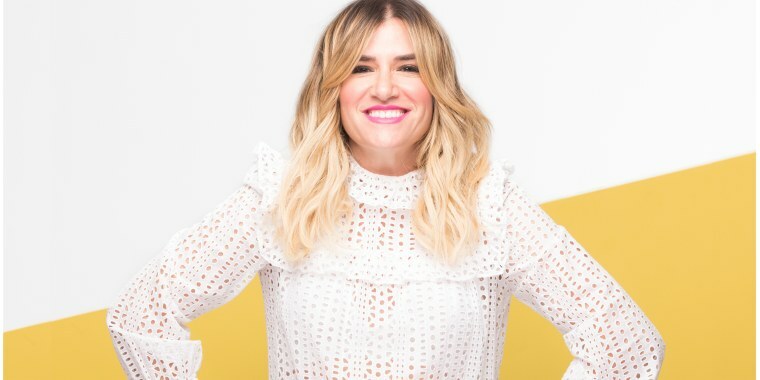 Drybar took off so quickly and became such an instant hit, and it really threw me in my life into kind of a tailspin (in a good way — I’m certainly not complaining about any of it!). I was working seven days a week for six months because it was so crazy and the business was so on fire. I think as an entrepreneur you get thrown into a million situations you’re not really expecting, and you just kind of deal with them. I don’t think I knew my life was going to change the way it did. I think that women should let themselves off the hook. Just because you’re a mom doesn’t mean you always have to be home with your kids. It’s about the support system you have. I was lucky that we lived near my mom. She was really like a second mother to my kids. I have always said it, that really in those early days, I wouldn’t have been able to do what I was doing — traveling all the time and putting so much energy into Drybar — if it wasn’t for my mom being the one that was home with my kids. If you do make the decision to be an entrepreneur and you take that kind of plunge, you’ve got to just be ready to work harder than you think you’re going to work and have a supportive family and partner that are going to let you do that without the guilt associated. 3. Break free of "mom guilt"
My kids were 5 and 3 at the time I started the business. Even now, they’re 11 and 13 and there’s still so much guilt. But I think that women should let themselves off the hook. Just because you’re a mom doesn’t mean you always have to be home with your kids. I stayed home for five years, and I was so grateful and loved that time, but I felt like I needed to do something for myself and get out there. I’ve always felt like if I’m happy and fulfilled personally, I’m going to be a better mom, just better at all of those things. I think a lot of women feel that way, and that is a very important thing to keep in the back of your mind. I went to probably the first 50 openings of all our stores and I would have butterflies in my stomach every night before we opened a new location. I would always worry, "Are people going to come? Is it going to work this time?" I think that the way I overcame it was to do everything in our power to spread the word, to pull all of our collective marketing ideas and thoughts. I’d give free blowouts away all day long just to get people in to experience it, because I’ve always felt like once we get someone into the shop and they experience it, they mostly fall in love. You never can rest. You never can stop working at it, and I don’t think you can ever get complacent or too comfortable and say, “Oh, we’ve had this much success so it’s just going to happen.” Being an entrepreneur, nobody cares about it as much as you, the way you do, so you just always have to push and push and push. When I give advice to young female entrepreneurs, I tell them it’s so much about perseverance and not letting the millions of obstacles that will inevitably pop up deter you. Stay the course. Keep your passion. Historically, men have had an easier time getting certain meetings and getting in the door in certain places where maybe women couldn’t. But I think those days are coming to an end. I think there are so many powerful women who are starting their own businesses, who are doing so many great things. I think things are definitely changing where women are taken just as seriously when it comes to business as men are. I certainly feel that way. Now, I feel like it’s based on what I’ve done and what I’ve built. It’s just a fantastic time for women.